Vecoxan is used for the treatment, prevention and control of coccidiosis in lambs and calves. Vecoxan in lambs is particularly useful if given at about 4-6 weeks of age, depending on the peak risk period which historically has been observed on a particular farm. If necessary, a repeat dose can be given 3 weeks later. (Usually lambs are born with immunity transferred from the ewe, but this gradually wanes and there can be a gap in immunity before the lamb's own immune system starts to provide proper protection. Vecoxan is used to bridge this immunity gap. Vecoxan for calves is best given as a single dose 14 days after moving to a potentially high risk environment, as shown by experience on a particular farm. The Vecoxan dose rate is 1ml per 2.5kg bodyweight. It is best to weigh one or two representative animals first, though safety margins are very high in the case of inadvertent Vecoxan over dose. White homogeneous oral suspension containing 2.5 mg diclazuril per ml. For the treatment and prevention of coccidial infections in lambs caused in particular, by the more pathogenic Eimeria species E. crandallis and E. ovinoidalis. To aid in the control of coccidiosis in calves caused by Eimeria bovis and Eimeria zuernii. Shake well before use. After using draw off cap, re-close container with original cap. 1 mg diclazuril per kg bodyweight or 1 ml Vecoxan per 2.5 kg bodyweight, as a single administration. 1 mg diclazuril per kg body weight or 1 ml Vecoxan per 2.5 kg body weight at about 4-6 weeks of age at the time that coccidiosis can normally be expected on the farm. Under conditions of high infection pressure, a second treatment may be indicated about 3 weeks after the first dosing. 1 mg diclazuril per kg body weight or 1 ml Vecoxan per 2.5 kg body weight, administered as a single dose, 14 days after moving into a potentially high risk environment. If a satisfactory response is not observed, then further advice should be sought from your veterinary surgeon and the cause of the condition should be reviewed. It is good practice to ensure the cleanliness of calf housing. 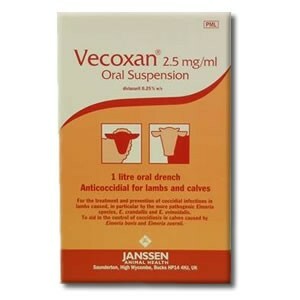 Vecoxan oral suspension was given to lambs as a single dose up to 60 times the therapeutic dose. No adverse clinical effects were reported. No adverse effects were noted either at 5 times the therapeutic dose administered four consecutive times with a 7-day interval. In calves, the product was tolerated when administered up to five times the recommended dose rate. For oral use in lambs and calves only. On rare occasions, in highly susceptible lambs, e.g. where they have been housed for long periods of time before being turned out onto heavily contaminated pasture, a severe scour has been seen shortly after dosing. In such cases, fluid therapy is essential and the use of a sulphonamide should be considered. It is also important to consider other potential pathogens that may be playing a role, e.g. Cryptosporidia, Nematodirus, rotavirus, Giardia and E. coli. Clinical coccidiosis generally occurs late in the parasite’s life cycle after most of the damage to the calf’s intestine has already been done. This severely damaged intestine can easily be infected by secondary bacteria and/or other agents. In cases of acute clinical coccidiosis treated with Vecoxan, fluid therapy is essential and the use of an antibiotic should be considered. Symptoms of clinical disease may remain obvious in some calves treated with Vecoxan, even though oocyst excretion is reduced to a very low level, and overall prevalence of diarrhoea is decreased. Lambs and calves: meat and offal: Zero. Any unused veterinary medicinal product or waste material derived from such a veterinary medicinal product should be disposed of in accordance with local requirements. Do not store above 30 °C. Protect from frost. 200ml,1 L, 2.5 L and 5 L polyethylene bottles. Not all pack sizes may be marketed. Diclazuril is an anticoccidial of the benzene acetonitrile group and has an anticoccidial activity against Eimeria species. Depending on the coccidia species, diclazuril has a coccidiocidal effect on the asexual or sexual stages of the development cycle of the parasite. Treatment with diclazuril causes interruption of the coccidial cycle and of excretion of oocysts for approximately 2 to 3 weeks after administration. This allows the lambs to bridge the period of decrease of maternal immunity (observed at approximately 4 weeks of age) and calves to reduce the infection pressure of their environment. Below are some recent questions we've received regarding Vecoxan Anticoccidial Drench, including answers from our team. My lambs are due their clostridial vaccination at age 2 weeks. Can I also give them Vecoxan at that age or is it a waste of time? Vecoxan info says treat from 4 weeks of age. It would be best to wait until 4-6 weeks old to treat with Vecoxan. This is when the maternal antibodies passed on from the mother will start to wane. At 2 weeks maternal immunity is still high enough to prevent coccidiosis so treatment is not needed.